SPURS suffered cup heartache on Sunday when they lost a seven-goal thriller at the Frederick Knight Sports Ground. The visitors looked to be cruising into the final four when they raced into an early 2-0 lead. But a frantic first-half finale saw Spurs hit back with three goals in six minutes to take a stunning lead. Striker Rosi Webb (pictured) struck from the edge of the area before Jessie Richards slotted home the equaliser. Webb completed the comeback with her second of the game. 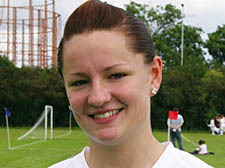 The north Londoners were unlucky not to add to their lead with both Richards and Faye Callaway hitting the woodwork. Their missed opportunities were to prove costly for the home side as Haringey pulled level on the hour mark, sending the game into extra-time. Both teams poured forward looking for the winner, and with just three minutes left before penalties it was Haringey who made the vital breakthrough as they scored to deny Spurs a mouthwatering semi-final tie against London rivals Millwall Lionesses. STUNNING strikes from Rosie Kosky and Vanessa Oppong saw Hampstead clinch their seventh win of the season on Sunday with an outstanding victory against Tottenham, despite being forced to play the entire game a player short. SHARP-SHOOTERS Shauna Lawless and Millie Pope scored two goals apiece as Hampstead ran riot against Watford in the Under-10s Division on Sunday. Georgia Allen was also on target as Hampstead ran out 5-0 winners. The 5-0 victory scoreline was repeated in the Under-11s League as Hampstead sealed a commanding win over rivals Hendon.